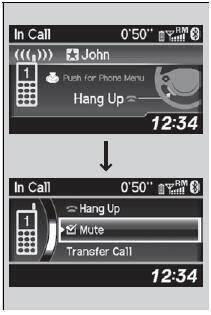 The following options are available during a call. Mute: Mute your voice. Transfer Call: Transfer a call from HFL to your phone. Touch Tones: Send numbers during a call. This is useful when you call a menudriven phone system. 1.To view the available options, press the PHONE button. 2. Rotate to select the option, then press . - The check box is checked when Mute is selected. Select Mute again to turn it off. Touch Tones: Available on some phones.